CNPS-SLO is going to SBBG! The Garden’s mission is to conserve native plants and habitats with an emphasis on vegetation communities of the Central Coast and the offshore islands. All plants used in the Garden are California natives. Departure – leave San Luis Obispo at 8:30 am. For carpools, meet at Santa Rosa Park (Santa Rosa St. at Oak St.) at 8:20 am. Or, drive yourself directly to the Garden, located at: 1212 Mission Canyon Rd., Santa Barbara. Transportation is by private vehicles, as transport using a rented van was judged to be too expensive. All participants should meet in the SBBG parking lot by 10:00 am. Are you interested in going? Please RSVP by sending an e-mail to Bill Waycott (bill.waycott@gmail.com) by Sunday night, Feb. 24 so we can get an idea of how many people to expect. Please indicate if you want to carpool. Thanks! Cacti originated in South America and evolved there for millions of years before any cactus was able to migrate to North America. In South America, there are still cacti that are ordinary leafy trees, cacti adapted to jungles, others that are at home next to snow banks high in the Andes. Argentina has giant columnar cacti that look like California’s saguaros, and nearby grow dwarf cacti that are smaller than your little finger when mature and flowering. Many cacti have spines that are modified into glands that secrete nectar: the cacti have a bargain with ants, trading a bit of sugar water for protection against mites. James Mauseth is a Professor Emeritus at the University of Texas at Austin, and a world-famous plant anatomist and cactus expert. An award-winning teacher, he has been invited to teach Plant Anatomy at Cal Poly this quarter. Jim’s specialty is plant anatomy, studying the cells and tissues of cacti and comparing them to the equivalent parts of plants that have more ordinary structures typical of non-succulent plants. He has traveled extensively in South America, and is a Fellow of the Cactus and Succulent Society of America. He will present a talk entitled The Evolution and Diversity of Cacti. This hike is sponsored by the San Luis Obispo Chapter of CNPS, the US Fish and Wildlife Service, and The Dunes Center, and will be led by Jenny Langford, Lauren Brown, Dirk Walters, and other local botanists and volunteers. avoided). For more information call Lauren Brown at 805-460-6329 or 805-570-7993. Heavy rain cancels this trip (light rain, bring appropriate clothing). NOTE: Pets, smoking, or alcohol are not allowed on the refuge, including the parking area, or other properties accessed during the hike (i.e., State Parks and private property). Pets may not be left in cars in the parking areas. Directions from the north: Take Hwy 101 south from San Luis Obispo. Turn right (west) at the new Willow Road off ramp (Exit 180). Proceed west on Willow Road for about 4.3 miles, to Highway 1. Turn left (south) on Highway 1 and proceed for 2.7 miles, to Oso Flaco Lake Road. Turn right (west) on Oso Flaco Lake Road. Proceed west on Oso Flaco Lake Road for 2.5 miles to Beigle Road. Look for a 6’ tall wire mesh fence and steel gate. proceed 2.5 miles to Beigle Road (on left). Parking: We will have people posted at the entrance of the USFWS fenced road to direct parking. The gate will be open around 8:30. Please do not park on Oso Flaco Lake Road near the gate as there is not much room and it could be hazardous. There should be plenty of room to park along the USFWS access road. The Oso Flaco Lake State Park lot is another ¾ miles west of Beigle Road, if you need to use a restroom before the hike (there are none along the hike route). Note: Pets, smoking or tobacco products, or alcohol are not allowed on the Refuge, including the parking area, or other properties accessed during the hike (i.e., State Parks and Private Property). Pets may not be left in cars in the parking areas. Additional Information: The Guadalupe-Nipomo Dunes Coastal Area contains the largest, relatively undisturbed coastal dune tract in California and was designated a National Natural Landmark in 1974. 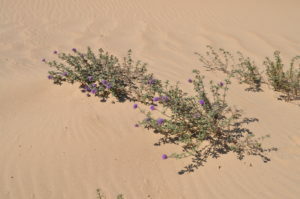 Five major plant communities are represented including pioneer/foredunes; coastal dune scrub; riparian woodland; coastal dune freshwater marshes, ponds, and swales; and active interior dunes. The flora includes many endemic plant species and the dunes habitats support numerous rare, threatened and endangered plants and animals.